This is a list of frequently asked questions that may give you the answer to some of the questions you've been longing to ask. 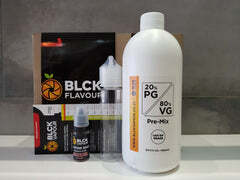 How do I pronounce BLCK vapour? How many different flavours do you have in stock? What bottles do the concentrates come in? Our 10ml, 30ml and 50ml concentrates are currently packaged in HD dropper bottles. We are in the process of moving over to PET bottles with a childproof cap. Are your products good quality? Our products are sourced directly from the manufacturers in USA, Italy, Poland and the UK. Our products are bottled locally by a 3rd party in a sterile environment so you can be assured you getting the same product as intended by the manufacturer. Why do your concentrates have your own bottle and not the manufacturers bottle? In order to keep costs down for the end user, we buy products in bulk and have them repackaged locally as it is too costly to import the original 15ml manufacturer bottle. However our 118ml and 473ml size bottles are sold in the original manufacturer bottle. What about your PG and VG? Our VG and PG is sourced locally and both products confirm to international standard. What is the expiry date on my product? Our products have a shelf life of 1 year from the date of purchase, we have now introduced batch numbers which can be matched up against the Batch sheet on our website (coming soon) so you can see the exact best before date of your product. Where do you store the products before I purchase it? Our products are store in a sealed warehouse at room temperature with no sunlight so you can be assured it hasn't degraded in any way before reaching you. We replenish stock on a daily basis, if there is an item which is out of stock, please send us an email and we will provide you with an ETA.